The biscotti/cantuccini obsession continues, and early this week I made yet another batch. Because it seemed like an interesting departure from the usual almond flavor, I chose “gingerbread biscotti” from Allrecipes.com. Along with making the house smell good, the biscotti were satisfying on so many levels that I’ll probably test a few different recipes to find the perfect “ginger flavored biscotti. These were good, but not perfect. First off, I missed the nuts. Also, I wasn’t crazy about the oil. It made the biscotti easier to eat, but I sort of missed the initial suspense of “Will I break a tooth, or won’t I?” that comes with the first bite of the harder no-fat variety. Or something like that. I used to love biscotti made with oil or butter, but I’ve grown fond of the hard type. So this recipe was good, but I do recommend adding some salt. I added a little over ¼ teaspoon plus a ¼ teaspoon of cayenne just because it enhances the spiciness. I just came across your blog in my search for a great gingerbread biscotti recipe, and have to ask……Well, did you try all these recipes? If so, which was the best???? Thanks! Thanks for digging up that vegan link, Lisa. I have a lot of gingerbread biscotti in my future. In case anyone was wondering, like I was, here’s the link to the Vegan Cookie recipe. Thanks for the new biscotti suggestions. I will add them to the list! Jen, I will search the net for the vegan recipe and if I can’t find it, I might request the recipe from you. This recipe has great flavor and you could probably swap out some of the AP flour for the whole wheat. Thanks Joe! I’m going to have to try that one, along with one I found on My Recipes (a Sunset recipe) and a Recipezaar recipe. Neither yours nor the Recipezaar recipe contains oil. The Sunset one calls for butter. It will be fun to compare all 4. 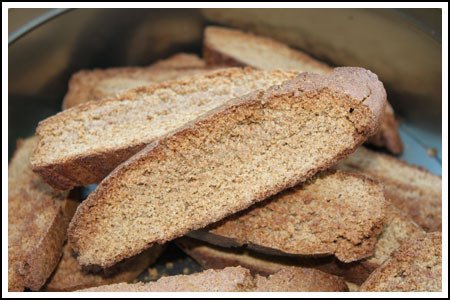 Here’s a link to the gingerbread biscotti that we make during the holidays. Tasty stuff! Sometimes I swap dried cranberries for the dried apricots. Do try them! I love the hard ones too! Definitely would like to try a pinch of cayenne too…great idea. Lisa, you might want to add a little salt too. I’ve tried this recipe before, but I’ll have to try it again with your addition of cayenne pepper. That might just be the kick I was looking for.